1. A sudden disaster, defeat, or humiliating failure: The results of the election was a total debacle for the former mayor who lost by a large margin. 2. Unexpected, disastrous collapses or downfalls: When the stock market crashed in 1928, financiers viewed it as a debacle that was totally unexpected. 3. A complete lack of success: After the debacle of the author's first novel, he had difficulty getting another publisher to consider printing his next fictional story. 4. 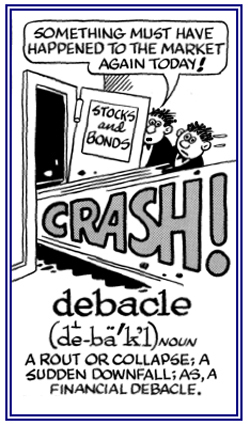 Etymology: originally, "breaking up of ice in a river, a disaster" from French debacle, "breaking up of ice, disaster", from debacler, "to free"; from Middle French débâcler, "to unbar" (de-, "off, un-", from Latin dis- + bacler, "to bar"; from Old Provencal baclar from Vulgar Latin bacculare; from bacculum, "bar, staff"; a variant of Latin baculum, "stick". © ALL rights are reserved. 1. To forbid, hinder, or prevent: Because of the girl's misbehavior at school, she was officially debarred from attending classes for a week. 2. To prevent something from happening. To free from ignorance in matters of taste and crude behavior including verbal expressions: Some people progress first by being debarbarized then they can progress to being civilized. 1. To lower the reputation of someone or to decrease the value of something: The mayor of Tom's city debased himself by lying to his citizens about his financial dealings with a company. 2. To make someone or someone less respected: Some people are convinced that commercialism will debase the sacredness or religious purpose of Christmas. © ALL rights are reserved. 1. A discussion in which reasons are advanced for and against some proposition or proposal: A debate may be an organized event, an informal discussion between two or more people, or a general discussion that involves several people. If something is a matter of debate, or is open to debates, then it means that people have different ideas and opinions about the subject. Rebecca's and Keith's quiet discussion about politics quickly turned into a heated debate. 2. 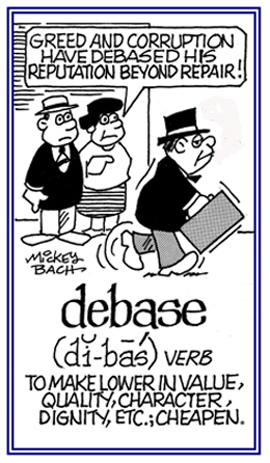 Etymology: from French debattre; originally, "to fight"; from de-, "down, completely" + batre, "to beat". 1. To talk about something at length and in detail; especially, as part of a formal exchange of opinions: The candidate for President of the U.S. was debating with his challenger in front of a TV audience. 2. To ponder, or to think, about something carefully: The accuracy of Dr. Clegg's opinion was debated by his colleagues. 1. A person who participates in discussions, informal or structured, about particular issues: Brenda is considered the best debater on our university team. 2. A disputant or someone who is involved in a formal discussion in a public meeting or legislature, in which opposing arguments are presented: The two senators, who were the debaters, had a heated argument about whether the U.S. should send more troops to the war zone. 2. Engaging in an argument by discussing opposing points. 3. Engaging in a formal discussion or argument. 4. A formal contest consisting of argumentation in which two opposing teams are defending and attacking a given proposition. 1. To deprive someone or something of strength and normal physical capacity and so feeling exhausted: Sharon was debilitated by the excessive hot weather and so she felt abnormally tired and incapacitated mentally and physically. One financial set back after another one can debilitate a company's prospects for continuing to stay in business. 2. Etymology: from Latin debilitat, the past participle of debilitare, "to weaken"; from debilitas, "weakness". 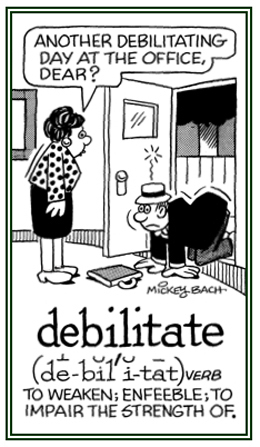 The cartoon below has an error in the woman's usage of "debilitating day" because she is expressing it as an adjective and not as a verb. Showing page 2 out of 44 pages of 646 main-word entries or main-word-entry groups.